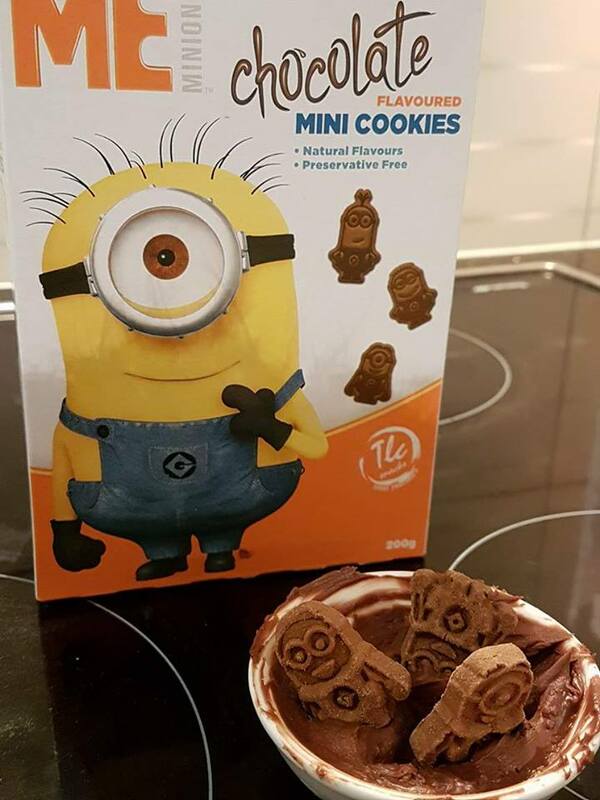 Crisp chocolate-flavoured mini-minion cookies. Made with natural flavours, preservative-free. 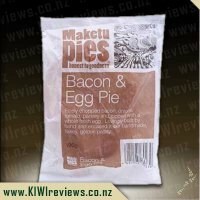 • Contains wheat (gluten), milk (dairy) and soy. • May contain traces of oats, eggs, peanuts and tree nuts. 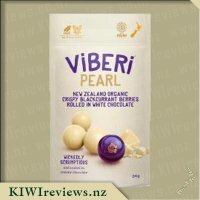 After receiving the box of products from KIWIreviews I was so eager to open to see what treasures awaited me, I opened it in the presence of my three young children. As soon as they saw the distinctive Minion on the box of the chocolate cookies they were intrigued and chaos ensued. Cue the constant nagging until I opened the box and gave each child a small handful of cookies. The packaging is very bright and striking and I quite enjoy the colour contrast with the Minion and the background. It is good that they showed there were 3 different characters in the box as my children wanted to make sure they got one of each. When I pulled the cookies out of the packet I remember thinking that they were the perfect size for my children, often they will eat half a biscuit and leave the rest, however, this was not a problem with these. The taste of the mini cookies reminded me of eating Tiny Teddies. The flavour of the chocolate was a bit odd, certainly wasn&apos;t what I was expecting, I would describe it as a malty taste similar to maltexo. The kids loved the taste and with the different designs on the cookies it kept them amused for a while. 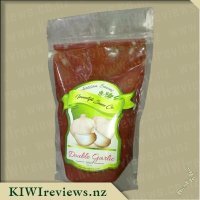 A great feature of these cookies is that they use natural colours and are preservative free. My children and I are now on the lookout for the other flavour available (banana) as these make a good snack for the children, especially in their lunchboxes or for parties. 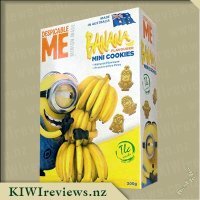 Minions are a huge hit in our house especially with the recent release of Despicable Me 3 my 5 year old has gone minion crazy so when he saw this box of minion shaped cookies you can probably imagine the excitement levels were pretty high. 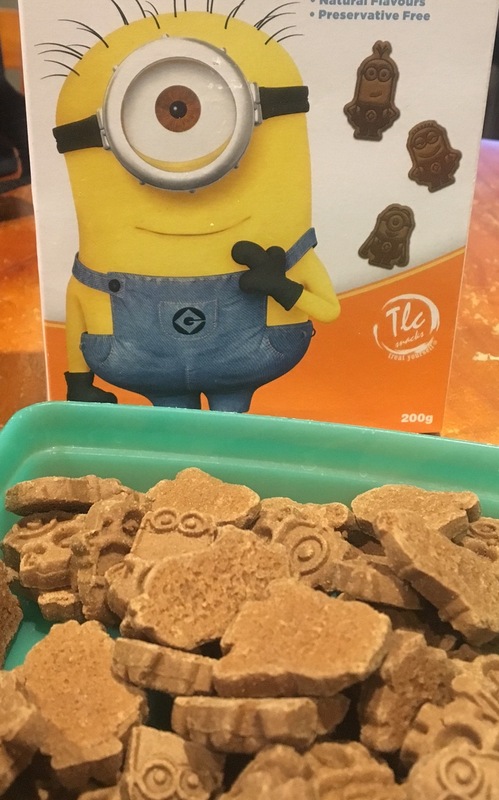 We opened the box and checked out the different designs of the minions picking out our favourites before eating them, it turned into more of a play with the minions than a snack eating experience as my little guy wanted to play with them at first rather than eat them. The box is a decent size for the price and quite similar to that of similar products on the market like tiny teddies or iced animals. These are a bit more unique in that they feature the minion characters which I have not seen before, we have seen aw patrol and scooby doo in the supermarket but never minions. I did think the taste was similar to the tiny teddy chocolate teddies it&apos;s not a strong chocolate flavour and reminds me more of a malt biscuit. The size is great for young children as you can give them a small amount as a snack and they think they are getting a lot even though the biscuits are bite sized. Great as a snack or a little treat in the lunchboxes. Definitely aimed more at children but as my children enjoyed them I would buy them again for them but probably not my first choice in biscuit. I love chocolate and so do all the lads on the work crew so I thought this would be a great thing to throw on the table during a coffee break and see what happened. I waited until it was my turn to do drinks duty, then plonked the box down in the middle of all the mugs and waited for the lads to file in. The first few didn&apos;t seem too fussed about the box. Instead they just filled their mugs from the coffee pot then sat down to rest but by the time there was maybe 5 guys around the table the box started to get some curious looks. One of the first questions was "who grabbed their kids lunch this morning by mistake?" which drew a lot of laughs but when I told them it was open-season and help themselves, a lot of big hands tried to empty the box at the same time. Yeah, the box split and cookies spilled everywhere but that&apos;s these blokes for ya. Didn&apos;t bother them, and everyone scooped up a handful for themselves. A lot of chewing, then someone said how dry they were and how they would be best if dunked. 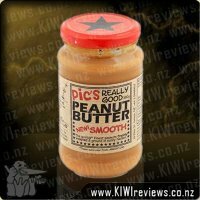 The common feeling was they were too small to dunk, to dry to eat as is, so some bright spark grabbed a jar of peanut butter out of the fridge and started scooping that onto his. Soon enough everyone wanted a try, but that was almost as bad. Hilarious to watch though, a bunch of burly men chewing on kiddies cookies covered in peanut butter. By the time break was finished, so was the box of cookies. No-one complained or had anything seriously bad to say about them, but no-one was really impressed by them much either. Sure, these are aimed at kids I suppose, but I can&apos;t see many kids enjoying a dry cookie either. Like all children mine are big minions fans, those little yellow fellows have imprinted on the children of this generation. Needless to say they were very, very excited about having minion biscuits in the house. 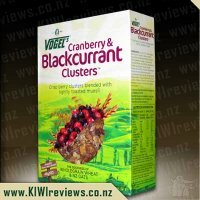 The box is bright and colourful and would be easily spotted at the supermarket, especially by anyone under the age of seven! When we pulled the biscuits out of the box there was a bit of a game at finding the different characters, and looking at the detail on the biscuits which was impressive, and the biscuits were a cute bite sized product. However, my family were not fans of the taste, one of them felt they were to strong, one felt they didn&apos;t have enough flavour and another was trying to name the flavour, I think they are &apos;malty&apos; in flavour. I took them to preschool for a late snack one evening and the preschoolers all asked for more, it&apos;s hard to get taste opinions from preschoolers but when they go back for seconds you know they are a hit. 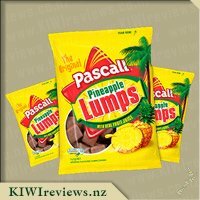 Perhaps the biscuit size, shapes and flavouring is all aimed at our youngest kiwi children? These biscuits come in another flavour too, banana, but judging from my families reaction we won&apos;t be purchasing them. 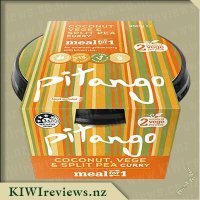 From a preschool teachers perspective these are a great size for a few in a lunch box, and they are egg free which I know is a must at most early learning centres these days. The biscuits are hard, and stayed fresh, and crunchy for several days. The box proclaims that they have natural flavours and are preservative free, which is also a must factor when purchasing snacks for children. 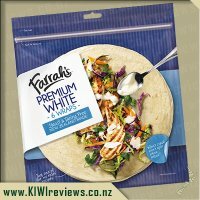 I opened this packet several days before carrying out my quest for feedback as I wanted to check how well the product would maintain its freshness, given that the packaging was not re-sealable. I left the biscuits in their open packet and was very pleased to find that there was no significant loss of crispness after several days. This is a positive as some biscuits appear to go soft overnight! On first sight, I was intrigued by the cute shapes of this product so I tried them on several different groups - work colleagues, some of my senior students, and family members. The feedback was fairly consistent. First, the appearance. Everyone loved the cute little figures. Miss Two was happy to get one for each hand; like all small children, she expects two of everything. The children, ranging in ages from two to eleven, were all positive about the taste - although they could not work out what the flavour was meant to be. We had not told them it was chocolate flavoured so there was some guessing as to what it was. Mr Seven thought he could taste drinking chocolate, and Miss Five agreed with him. Mr Ten said he had tasted this flavour before when he had made a chocolate cake using a cake mix. His sister, Miss Eleven, disagreed; she said the taste reminded her of a toffee bar. My students were not too keen on the flavour at all. One said if she had not known it was chocolate, she would have thought she was eating a malt biscuit. They thought they would be better served with a dip, possibly one made of melted chocolate, or iced with chocolate icing. My malt biscuit champion also thought they might be nice dunked in a hot drink, and demonstrated how you could hold the biscuit by one "hand" so as not to lose it in the liquid! 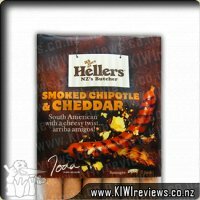 My colleagues&apos; comments ranged from "not a lot of flavour" to "really interesting flavour but I just can&apos;t put my finger on it". 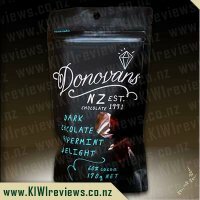 All in all, people in general liked the product; they just did not accept it as chocolate flavoured. One colleagues thought it would be better marketed without the word "chocolate" being mentioned at all. She would then be more likely to give it the thumbs up. My own reaction was similar - the impression I got was that the flavour is one that is common in many diet bars and shakes, a low-sugar, low-fat substitute for conventional chocolate. 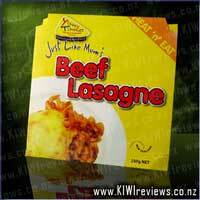 The product is described as preservative free and made with natural flavours, so this would make sense. I thought the biscuits were ok, but nothing special - the selling point for me would be the attractive shape. They would be great for a little kids&apos; party or as a lunchbox snack for younger children. This review will be rather similar to the review for the banana variety, as apart from the flavour difference, the product is identical. 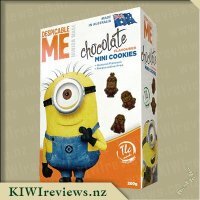 The product involves 200g of chocolate flavoured mini minion shaped cookies, in a plastic packet, itself inside a cardboard box. The 200g works out to around 10 servings of 20g; the servings are not packaged separately, so unless you are weighing them, the servings size would be an approximation (there&apos;s no 10 cookies equals 20g conversion). 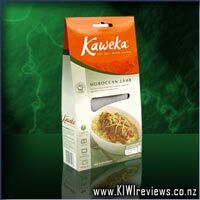 This has the same issue with the packaging where there is no resealability factor in the plastic packet or cardboard box, so unless you are going to eat it all in a couple of days, you&apos;ll need some pegs, bag sealers, or airtight containers to store them in, otherwise they will go very soft. This chocolate flavour has a much stronger aroma, and smells slightly bitter, like that of cocoa (interestingly cocoa isn&apos;t mentioned as an ingredient in this chocolate flavoured product). The flavour is quite strong, though the sweetness of the flavour is subtle, which gives the product a lower calorie count than that of the banana variety (84 calories per 20g, vs 91 calories). I really think more effort should have been put into the packaging of the product. If not making the packet resealable, then smaller packs that hold a serving each, or include some kind of dipping sauce would be ideal; these mini cookies definitely get stuck in your teeth if you eat them plain. 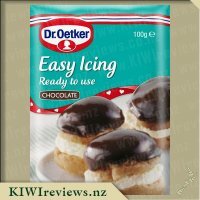 Packed differently, these would make a great treat for the kids at school. But as is, it would work well for kids parties, or large families, where 10 servings would go very quickly.